Listings, Reviews, Social Performance, Web Presence. How does your business's online presence stack up to your competition? 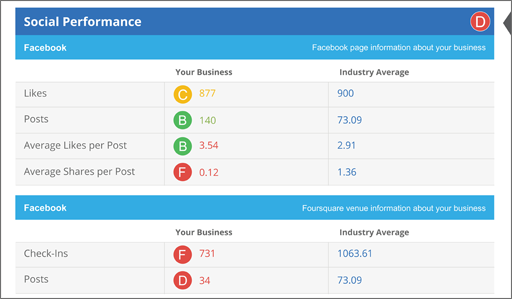 The Snapshot is a personalized report that surfaces and compares a business's online presence to others in the industry. These four pillars of the virtual doorway - listings, reviews, social and website - will help you to understand where the business needs the most help and how you can help them! Request your Free Digital Snapshot Today! This first section is a summary of what’s to come in the Snapshot Report. Grades are calculated based upon Google and other search engine‘s rankings. This digital report card is measured against the business’s anchor data - name, address, phone number, and website. There’s no pass/fail here, a business should strive to be as close to 100% as possible. The better the grade, the better the business performs online, which translates into more customers and happier customers. If you see B, C or D’s here, there is plenty of work to be done! Request your Free Digital Snapshot Now! Improves a business’s search rank and makes them discoverable. Listing presence is crucial to online health. Without online listings, potential customers are sure to turn to the competition. - If the score is positive, you’ve got the first part covered! 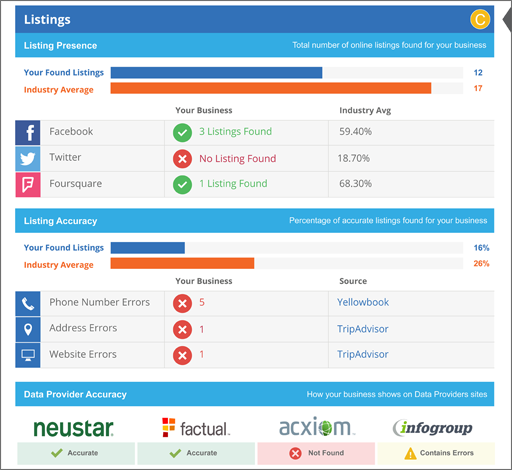 Next, employ Listing Distribution can ensure that your business’s listings remain correct over time. If you ever move, your location will be updated on 300+ sources across the web. - If the score is negative, Listing Distribution and Reputation Management are your new best friends! Listing Distribution corrects and maintains existing listings across major sources. Reputation Management shows you where your information is listed incorrectly. Correct information gets customers in the store. Accurate listings ensure a customer can find and contact the business. Incorrect listings lead to unhappy and frustrated customers. It’s not enough to be listed, you must be listed correctly! These are the four major listing data providers. Factual, Acxiom, Infogroup and Neustar (Localeze). These data providers are referenced by over 300 online listing directories and disseminate business info all over the web. - Your listings are healthy! Your listing exists (presence) and they are correct (accuracy). This is no small feat, ensure the green remains with Listing Distribution. - Red - Looks bad, but it’s not as bad as you think! You have not been found, so let’s go ahead and turn on Listing Distribution which will push out the correct data. - Yellow - This is where the real trouble is! Although your business listing has been found, it is not accurate. Somewhere and somehow, the wrong information about your business got out and is now being circulated. You need Listing Distribution pronto to help correct these errors that could be costing you business. Reviews are structured mentions which are classified or ranked in some way, star rating or numerical. Customers share their opinions online through testimonials, articles, blogs or even offhand comments on social media. This 24/7 chatter is exactly what local business owners need to be paying attention to. - If the score is positive, great job! Your business has worked hard to earn a solid reputation. Now let’s add Social Marketing to amplify all of that positivity and use the RSS feeds to provide relevant content to you customers and help schedule posts. - If the score is negative, we can help! Reputation Management provides insight into where the negative sentiment directed at your business is coming from. Adding Review Generation will allow for the perfect avenue to collect more reviews - positive reviews can easily be displayed and published whereas negative reviews can be dealt with privately. Social channels can help local businesses grow their fan base and turn online leads into raving customers. Every day, millions of consumers declare their buying intentions on social media. Successful customer service is about two-way communication. Your customers commenting on social are just as important as your customers calling into your store’s phone line. - If the score is positive, you’re off to the right start! However, managing multiple social networks is difficult and time-consuming. Social Marketing is an easy way for local businesses to continue to build their social presence and find new leads. - If the score is negative, we need to get you to the 21st century where customer service lives online! Social Marketing can monitor and manage customer activity in a single feed, respond to customers online straight from the activity feed, and track every interaction. - If the score is positive, your site is as quick as can be! But is there anything else you could do to help decrease the load time? After all, there’s no such thing as a site loading too quickly. - If the score is negative, looks like you’ve got a few things to fix! Large images look great but not at the expense of a frustrated customer. - If the score is positive, great! Now, do you have multiple tabs or pages to your business’s website? If so, is all of this information readily available? And let’s take it one step further and collect reviews on this killer site of yours with our Review Generation widget! - If the score is negative, uh oh! You’ve got two choices - fix what’s broken or take advantage of our mobile optimized Location Page! It’s simple to create, search engine optimized and additional tabs can easily be added - no coding knowledge required. What does your website look like on a mobile device? Is it easy to navigate and scaled to the right size? The majority of search, especially if it’s for the first time, takes place on a mobile device. - If the score is positive, you’re on the right track! - If the score is negative, uh oh! You’ve got two choices - fix what’s broken or take advantage of our mobile optimized Location Page! It’s simple to create, search engine optimized and most importantly it’s mobile responsive.